Messier 84 (M84) is an elliptical or lenticular galaxy located in the inner region of the Virgo Cluster, in the constellation Virgo. The galaxy lies at an approximate distance of 60 million light years from Earth and has an apparent magnitude of 10.1. It has the designation NGC 4374 in the New General Catalogue. Messier 84 occupies an area of 6.5 by 5.6 arc minutes of apparent sky, which corresponds to a linear diameter of about 110,000 light years. The galaxy is one of the brighter members of the Virgo Cluster, but not easily spotted in 10×50 binoculars. It can be seen with large binoculars and small telescopes, but requires clear, dark skies. Messier 84 is located near the border with the constellation Coma Berenices. It can be found halfway along the line from Denebola in Leo to Vindemiatrix in Virgo. Another Messier object, M86, can be seen just 17 arc minutes to the east of M84. The two galaxies appear in the same field of view in binoculars and small telescopes. In small telescopes, the galaxies appear as small, oval-shaped patches of light with brighter centres. They are best seen in medium-sized and large telescopes. In 8-inch telescopes, several other galaxies can be seen in the vicinity, including NGC 4435, NGC 4388, NGC 4402 and NGC 4438. 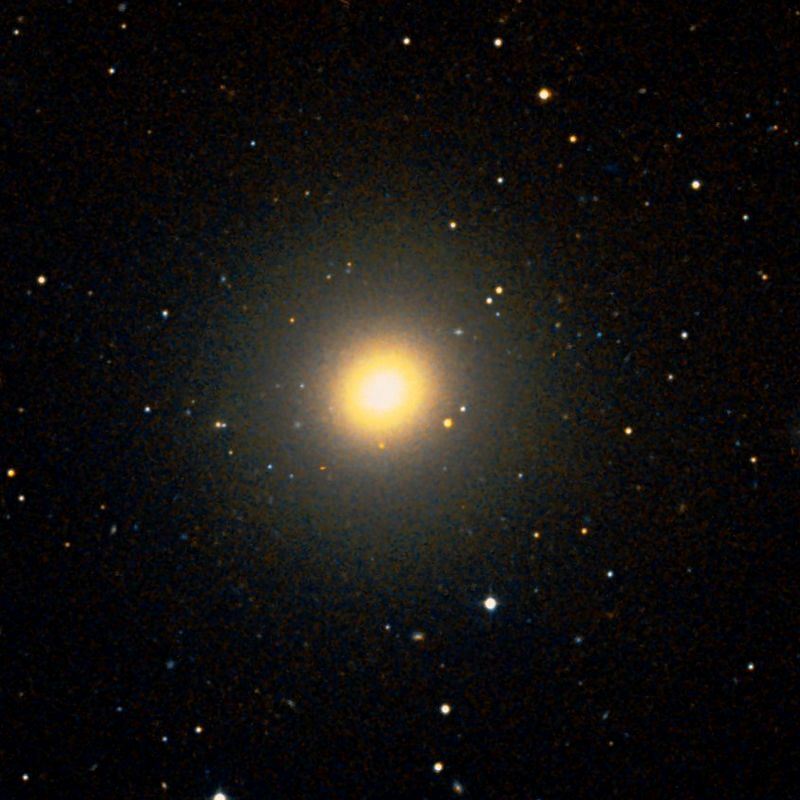 The giant elliptical galaxy M87 lies about 1.5 degrees to the southeast of M84 and M86. 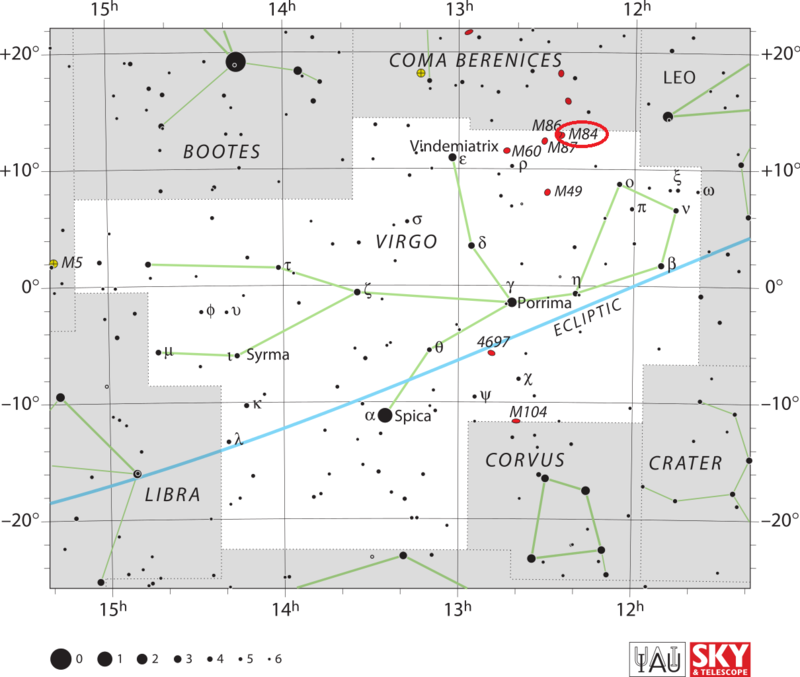 The best time of year to observe M84 and other galaxies in the Virgo Cluster is during the spring. Messier 84 is either an elliptical galaxy of type E1 or a lenticular galaxy of type S0 seen face-on. 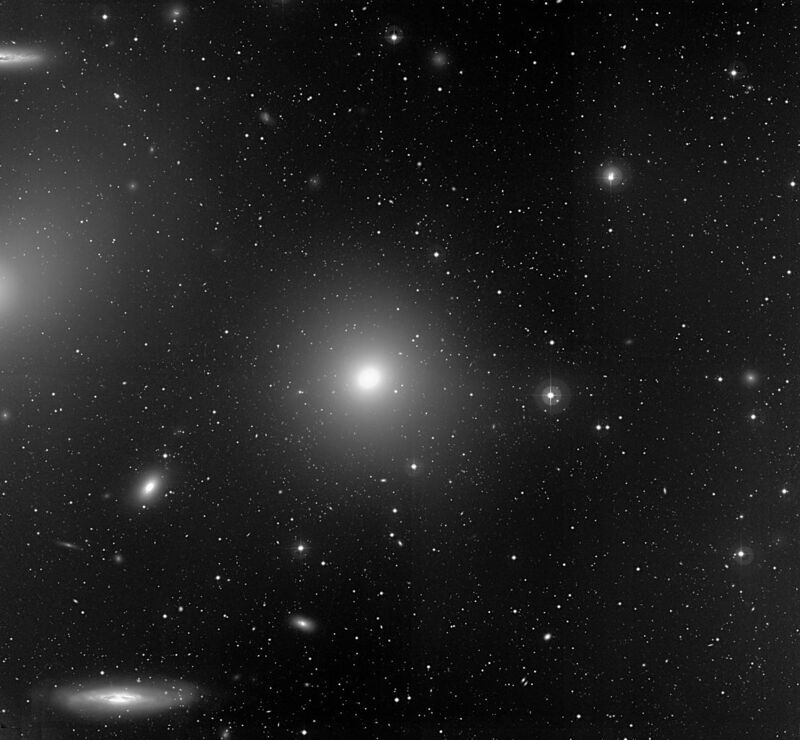 It is situated in the inner core of the Virgo Cluster, a region populated with galaxies, including Messier 49, Messier 60, Messier 86, Messier 87, the edge-on spirals NGC 4388 and NGC 4402, the elliptical galaxy NGC 4387, the barred spirals NGC 4413 and NGC 4425, and the interacting galaxies NGC 4438 and NGC 4435. M84 is part of Markarian’s Chain, a stretch of galaxies that appear in a curved line when seen from Earth, named after Armenian astrophysicist B. E. Markarian, who discovered the galaxies’ common motion in the early 1960s. 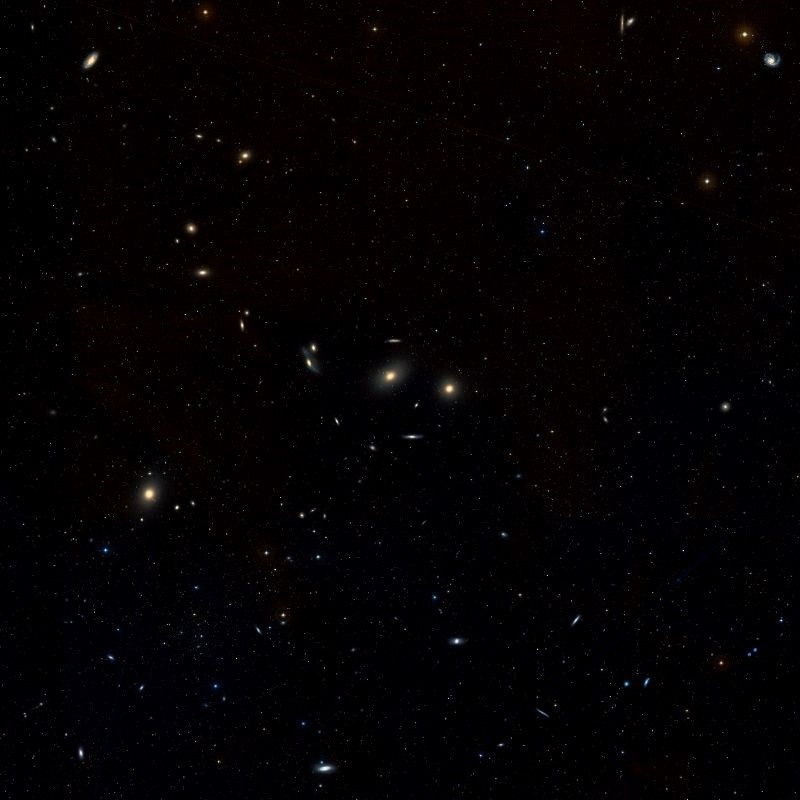 Some of the galaxies are superimposed, but others appear to move coherently. 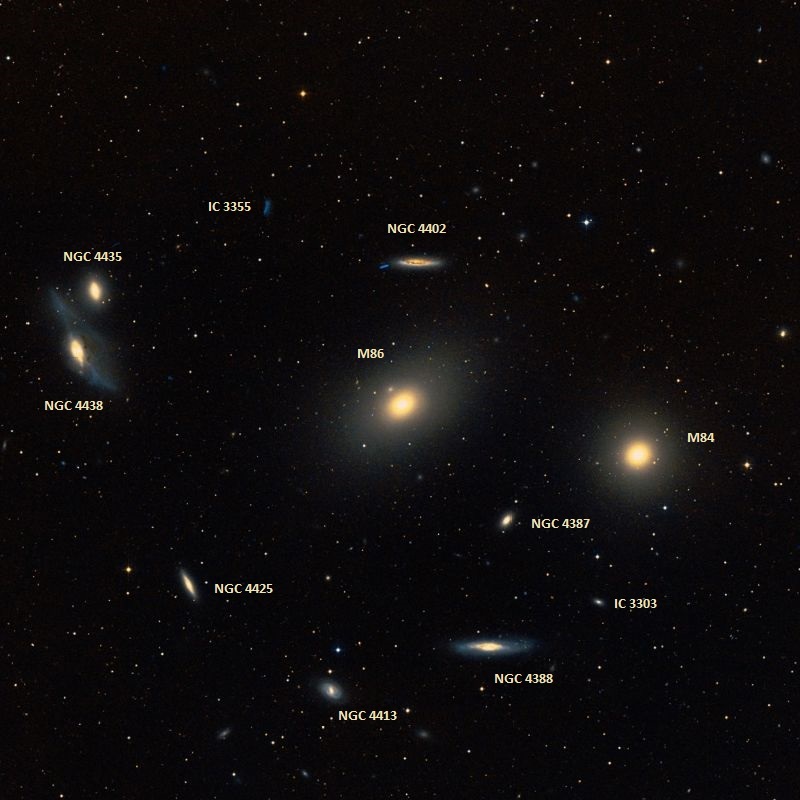 The galaxies that are part of Markarian’s Chain include M84, M86, NGC 4477, NGC 4473, NGC 4461, NGC 4458, NGC 4438 and NGC 4435. Messier 84 contains few young stars and clusters, indicating that star forming activity in the galaxy is at a very low rate. The galaxy is receding from us at 1,060 km/s. Investigations in radio wavelengths and images taken by the Hubble Space Telescope in 1997 have revealed two jets of matter emanating from the core of M84 and a disk of rapidly rotating stars and gas, which indicates that the galaxy contains a supermassive black hole at its centre. The black hole has an estimated mass of 1.5 billion solar masses. Two – possibly three – supernovae have been observed in the galaxy in the last century: SN 1957B (magnitude +13) on May 18, 1957, SN 1991bg (mag.+ 14) in December 1991, and SN 1980I (mag. 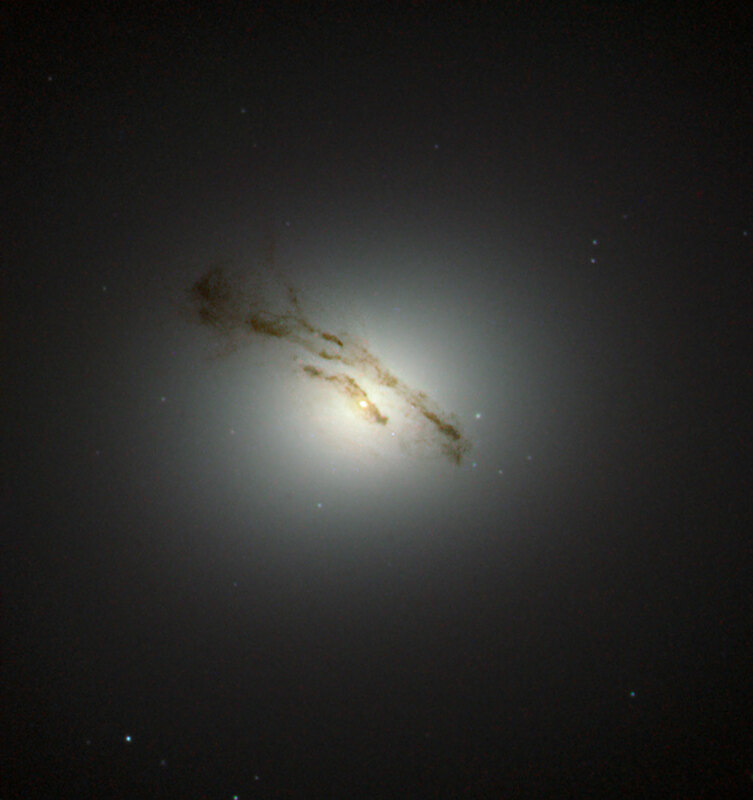 +14), which occurred either in M84 or one of its neighbouring galaxies – M86 or NGC 4387 – and was detected on June 13, 1980. All three supernovae were classified as Type Ia, which means that they were triggered by violent explosions of white dwarf stars. Messier 84 is one of Charles Messier’s original discoveries. Messier discovered the object on March 18, 1781 and subsequently added it to his catalogue. On the same day, he also discovered and catalogued the globular cluster Messier 92, located in the constellation Hercules, and seven other galaxies in the Virgo Cluster: Messier 85, Messier 88 and Messier 91 in Coma Berenices, and Messier 86, Virgo A (M87), Messier 89 and Messier 90 in Virgo.